The Redwood ST2-Mini Electric Guitar in Black is ideal for younger players, beginners, and those with a shorter playing reach who are embarking on their musical journey. The diminutive dimensions of the body make the ST2-Mini a more accommodating model for people who aren't quite ready for a full-size guitar. Redwood have gone all out to ensure the longevity of the ST2 by combining superb tonewoods with solid build quality, and all pieced together into an instantly recognisable double-cutaway body shape. The body is crafted using alder, a tonewood that is favoured for its balanced timbre with subtle low-end, punchy mids, and crisp highs. Whatever style of music you play from jazz to funk, blues to rock - and everywhere in-between -, alder provides a versatile tonal palette to play with. The ergonomically designed body is shaped to a very popular double-cutaway profile, with contours and bevelled edges for enhanced playing comfort. Whether you're seated or standing, the ST2-Mini sits snugly against you throughout each performance. Thanks to the double-cutaway profile, the highest frets are within easy reach. Fitted to the body via a sturdy bolt-on construction is a durable Canadian hard maple neck. Shaped to the comfortable "C"-shape profile, the scaled-down dimensions of the neck make it very easy for smaller hands to navigate. The back of the neck has been treated with a matte finish to reduce the chance of stickiness from affecting the playability of the neck, which promotes a smooth and fast-playing feel. Married to the neck is a 22-fret rosewood fingerboard, with dot position inlays to guide your way. A composite fingerboard creates a luxurious playing feel, whilst holding up well to consistent playing so that you can pick up and play anytime. The ST2-Mini is equipped with a single-coil pickup in the neck position, and a humbucker in the bridge position. The single-coil offers a chunky output, which offers a little sizzle that sits just perfectly for playing blues, jazz, funk, rock, etc. The humbucker gives a crisper tone, and a thick mid to low-end energy that makes it great for cranking out some fat riffs. Alternatively, you can dial this back and appreciate the smoothness of the output with exceptional clarity throughout. Control over the pickups comes in the form of single master volume and tone controls, with a three-way pickup selector switch that enables you to select either pickup individually, or combine the output of both for a wider and fuller sounding output. The headstock is fitted with sealed die-cast tuning machines, which secure strings firmly so that once you have set your desired tuning, it remains that way throughout each and every performance. The body is home to a vintage-style steel tremolo bridge, which creates a seamless connection between the strings and body to optimise intonation and sustain, whilst allowing you to have effortless tremolo control as you play. The body is finished in an understated yet stylish black, with white pickguard protecting the top around the pickups and control pots across the lower bout. Posted on 15/03/2019 by Alan It is beyond unbelievable that for less than £60 you can buy an instrument like this. One the plus side, the quality of build is excellent and both pickups and the two pots work very well. The volume and tone work gradually without sudden drop-off or spikes. The jackplug connection is secure. The 3-way switch works smoothly without clicks and there are definite tone differences between the 3 settings. Tuners seem perfectly adequate and can be adjusted. Finish to neck, fret-edges and body are not just good, they are very good. The fretboard is likely to be a tad dry and will benefit from a wipe-over with lemon oil or Guitar Honey when you change strings. And on that theme ... the original strings were adequate but I restrung using my preferred brand. (Elixir in this case, although I also like D'Addario). Now for the negatives of which there are a few, but nothing dramatically worrying. From the box, the neck needed considerable adjustment at the truss rod. There was a distinct and visible 'banana' dip which wrecked intonation and made the action uncomfortably high (except for a slide player). Intonation at this stage was so poor that fretting the D string at the third fret produced F#! This problem was carefully and easily rectified using the well-known phrase "righty tighty, lefty loosey". In this case the truss rod needed to be tightened --- so much so that after leaving the guitar overnight to rest and settle down, the original tuning of EADGBE had been raised by nearly TWO tones before the neck had become stable in a correct alignment. The 6 saddles were originally set very high. After adjusting the neck, the saddles for the 6th to 3rd strings needed lowering but the saddle for 2nd and 1st could be left. 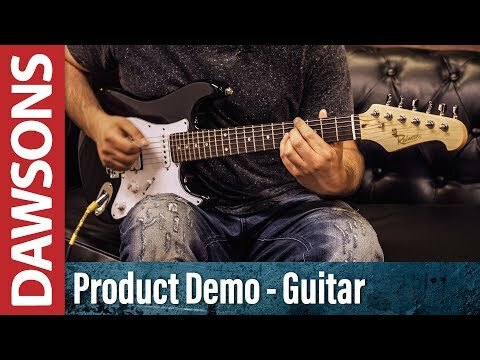 So - in conclusion, this insanely affordable 3/4 size guitar has the potential to be a really excellent instrument for a beginner or a 'noodler' ... BUT do expect to have to make adjustments before it will play in tune both across and up and down the neck. Also change strings and feed the fretboard to keep it in good condition.